I have another sour cherry jam recipe to share with all of you. It is sour cherry and petit petit wine and the combination is rich and deep. Spooned over ice cream it reminds me of the deep, intense flavor of hot fudge. The wine brings out the flavor of the cherries, making them more complex. However as much as I love eating this new jam drizzled over a bowl of ice cream, even talking about making jam seems like too much for this hot humid dead air day. So instead let me share some cocktails with you. These cocktails are easy to make and do not rely on store bought mixes, but rather on fresh produce (and a modest amount of sugar). Several years ago we were stopped at a rest stop in New Hampshire shopping for alcohol for our week on the Cape. There is no tax on alcohol in New Hampshire so several of their rest stops have liquor stores with giant shopping carts, mega sized bottles of spirits, and "Don't Drink and Drive" signs on the way out of the parking lot. Lewis looked dubiously at the large bottle of gin in our cart and told me I was on my own when it came time to drinking the gin. More gin and tonics for me did not seem like a problem. I have loved gin and tonics since I was six and my family went on vacation to Barbados. There was a lime tree in the back yard of the house we were staying at and my parents felt it was important to use as much of the fruit as they could. They would let my brother and I to take a sip of their drink, and I quickly began turning my back to them when I was taking my sip. I hoped that they might not notice how much I was drinking if my back was turned. So even if Lewis did not want any I would happily drink as many sips as I wanted on my own. When I made myself a Gin and Tonic on vacation Lewis took a taste, and then turned his back so I would not see how much he was drinking. After that he was a devoted lover of Gin and Tonics, the first one to speak up when we needed to restock any of the ingredients. The only problem with them is the tonic, with an ingredient list that makes me shudder with its high fructose corn syrup. I have found a homemade tonic recipe online but have not tracked down all the ingredients. 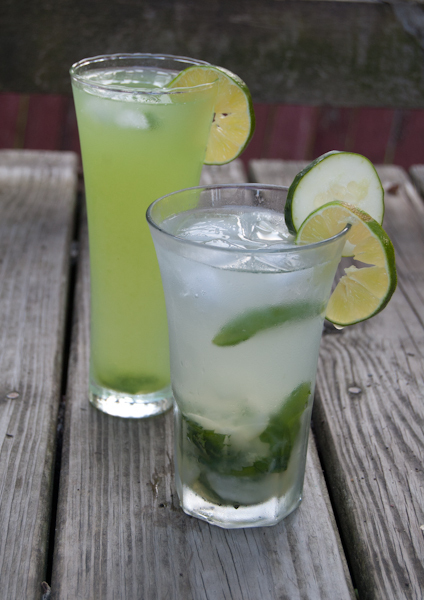 Enter the East Side Fizz and the Pea Shoot cooler, both made with fresh ingredients and a wonderful way to use some of the mint threatening to take over your yard. The Eastside Fizz was in July's issue of Bon Appetit's. The original recipe calls for seltzer water but I did not have any in the house, plus my frugal nature balked at paying money for bubbles. I love it made with just plain water but you should spring for the seltzer if you would prefer. One of my favorite parts of this cocktail is eating the gin and lime infused cucumbers at the end. The pea shell cooler came about as we were all enjoying a bowl full of shelling peas. I looked at the pile of empty shells and wondered what I could do to utilize their sweet flavor without having it masked by their tough stringiness. So I tried them in place of the cucumbers in the Eastside Fizz, adding the prosescco to lighten it and play up the citrus. 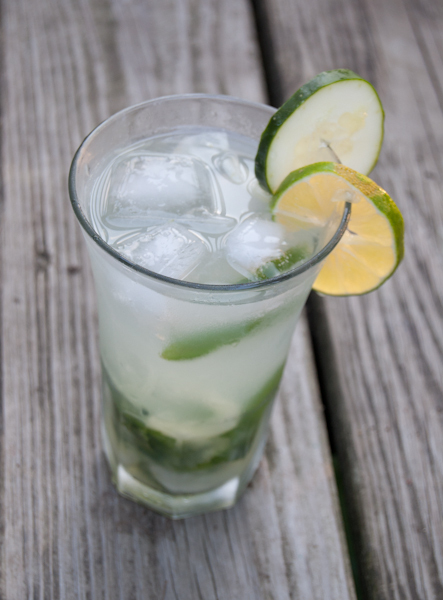 Muddle mint, cucumber slices and simple syrup in a tall glass. (Muddling means you squish the ingredients up with a muddling stick in the bottom of the glass. This bruises the ingredients and releases the oils so the flavors infuse the simple syrup). Add the lime juice, gin, ice and water or seltzer to fill the glass. Stir well, allowing the ice a chance to cool down the drink. When you are done drinking don't forget to eat the cucumber slices. Muddle the pea shells, mint leaves and simple syrup in a glass. (Muddling means you squish the ingredients up with a muddling stick in the bottom of the glass. This bruises the ingredients and releases the oils so the flavors infuse the simple syrup). Strain the liquid into another tall glass and add lime juice, gin, prosecco, ice and water or seltzer water to fill the glass. Stir well and allow to chill for a moment before serving or drinking. If you have a cup off water you would use a cup of sugar. Add the sugar to the water in a saucepan and heat gently, stirring occasionally until the sugar dissolves. Turn off the heat. Now you have simple syrup! 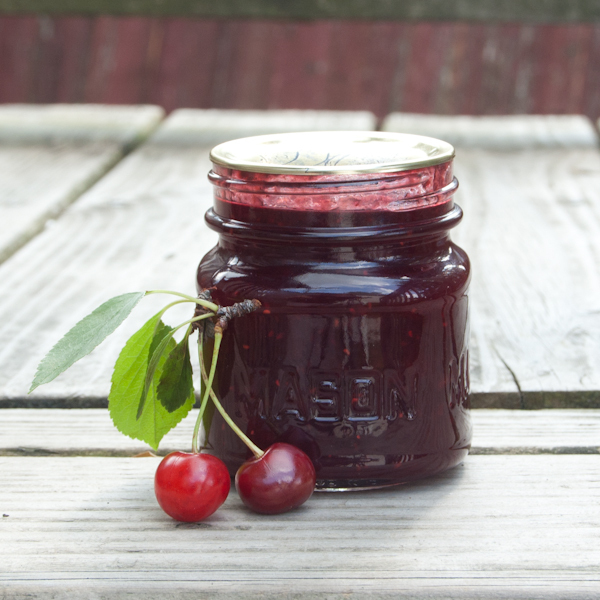 Last years sour cherry jam was a success because it set without using commercial pectin, it made a really beautiful translucent jam with preserved cherries suspended within, and many who scored a jar raved about it. The only problem is my family did not like it. Turns out we prefer a jam with a more consistent texture and flavor, one where the whole fruit adds body to the whole jam instead of occasional solids floating in jelly. We are not big jelly eaters and missed the body of the jam having more substance and texture. Which is fine with me as French preserves are more time and labor intensive requiring multiple steps, fruit straining, simmering etc. So this year I got to start over after picking 12 pounds of sour cherries at a local orchard. Last years jam was really just the cherries, so this year I decided to play a little more. Plus I have a friend with a flat of raspberries at home who I saw in the fields. So my first inspiration was sour cherry raspberry. I decided to use lime in place of the usual lemons after seeing raspberry jam recipes made with lime. Plus my newest summer drink obsession means I have been stock piling limes. 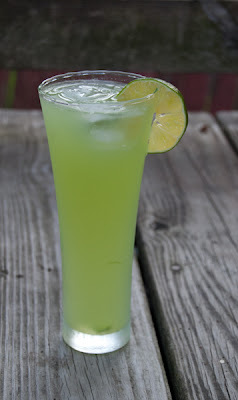 This recipe depends on the pectin in the limes, especially the peels to to gel. Probably a little easier for the average person to get then unripe green apples. The results were an unmitigated success. The boys have enjoyed it drizzled over ice cream and have happily greeted it on toast for 2 mornings in a row without complaining. Truth be told, after the first breakfast they looked critically at the 4 jars lined up on the counter and told me I needed to make more. My boys have learned how to judge how many jars of jam they will need to get through a winter. When I tasted it I was surprised at all the flavors, wondering at first at a subtle background taste I could not place. Then I remembered the lime, which adds more to the overall taste then the bright acid flavor from lemon juice. It is tart and sweet with a richness that is addictive. Plus it set up beautifully with a minimum of hanging over a hot pot in July. Last summer my kitchen scale broke and has refused to measure in anything other then ounces, or allow me to tare out the weight of anything on top. I replaced it with a new scale that remembers the previous weight when it turns itself off. Now as long as I pay attention to when the display goes blank I can slowly weigh cherries as I pit them. A vast improvement over my old scale where I had to occasionally write down the weight I was at and start over. Note: There is sugar listed twice as it gets added with the raspberries and with the cherries. I have given conversions from Metric but they are just approximate, I created the recipe using weight. Bring raspberries and 200 grams sugar to a simmer, simmer for 5 minutes. Turn off and allow to cool slightly (I let it cool just long enough to set up my Fruit and Vegetable Strainer ). Set the raspberries aside and combine the pitted cherries, 500 grams sugar and lime juice in a large pan. Bring up to the simmer and simmer gently for 5 minutes, crushing the cherries with a potato masher as they cook. Remove the seeds from the raspberries in a food mill, chinois, sieve or a Kitchen Aid attachment. Add the raspberries to the cherries along with the reserved lime peels. Heat the jam over high heat, once the fruit is boiling stir constantly until the setting point is reached (this jam was set for me at 220°). You can also do the cold plate test, when you think your jam is set place a small amount on one of the plates in the freezer and place it back in the freezer for several minutes. Test the dollop of jam by pushing it with your finger, if it wrinkles up it is gelled and you can can your jam. Remove the lime peels from the jam before canning. Ladle hot jam into hot jars, leaving 1/4 inch headspace. Wipe the rims clean with a damp paper towel or cloth and place on 2 piece lids and tighten by hand. Place filled jars in a water bath canner with water covering the jars by at least 1 inch. Boil for 10 minutes, when the 10 minutes is completed turn off the heat, remove the lid and leave the jars in the canner for another 5 minutes. Place the jars on a towel, dish cloth or receiving blanket or a cooling rack, with at least 1 inch between jars. Allow to cool completely, 12 to 24 hours. Once cool take off the bands, test the seal by pushing up on the lid with your thumbs. Any jars that have not sealed properly can be placed in the fridge. Clean the top of the jars, label and store in a cool dry place.